The HP 9000/425e is quite an odd machine. 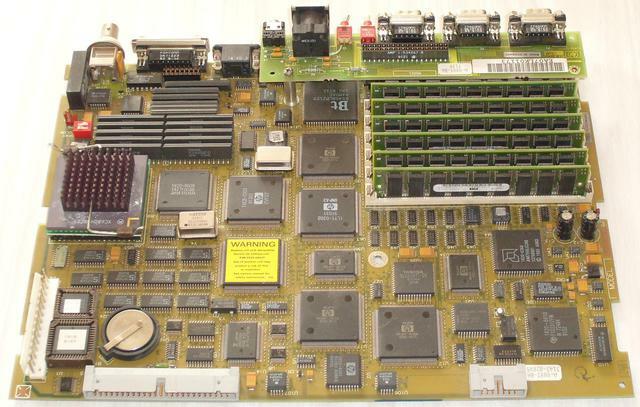 I would dare say this machine looks like an Apollo 2500 motherboard fitted in an HP 9000/705 chassis, but this would be taking too many shortcuts... and not quite right. Just like the Apollo 2500 indeed, this machine comes in a compact case, and fits anywhere on a desk. Despite lacking expansion capabilities (since there are no expansion slots), this is nevertheless a versatile machine, using industry standard parity memory SIMMs, and the only pre-PA-RISC system to use a regular HD15 VGA connector for video output. This is also the only such machine with digital audio capabilities. 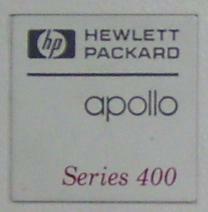 This machine comes in a small pizzabox case, which was reused from the successful HP 9000/700RX X terminal, as well as the HP 9000/705 and HP 9000/710 early PA-RISC workstations. It has room for two internal storage devices, of which the rightmost one can be a removable device (either a floppy, tape, or CD-ROM drive), using a different front bezel. By removing two screws in the back, the top, as well as a side, of the case can be removed to expose the internals. According to the documentation, there is supposed to be a so-called ``support brace'' going from the power supply to the right edge of the case, to improve case rigidity. One can even notice the two protruding notches where it is supposed to latch. There wasn't any when I got this machine, it might have been lost. The motherboard lies at the bottom of the chassis, with a support tray for the storage devices in the front of the case. 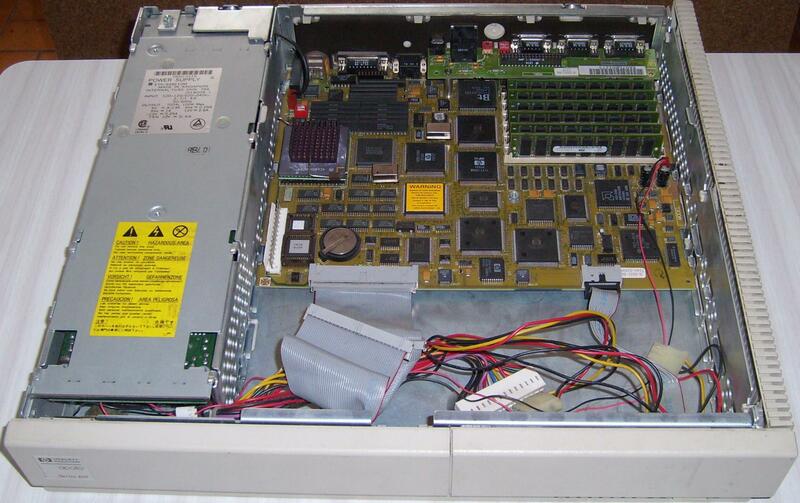 When I got this machine, there were no disks in it (not even the internal SCSI cable! ), therefore I do not have the appropriate disk brackets. After experimenting with different ways of mounting a disk inside, I ended up reusing a Sun UltraSPARC 5 disk bracket. 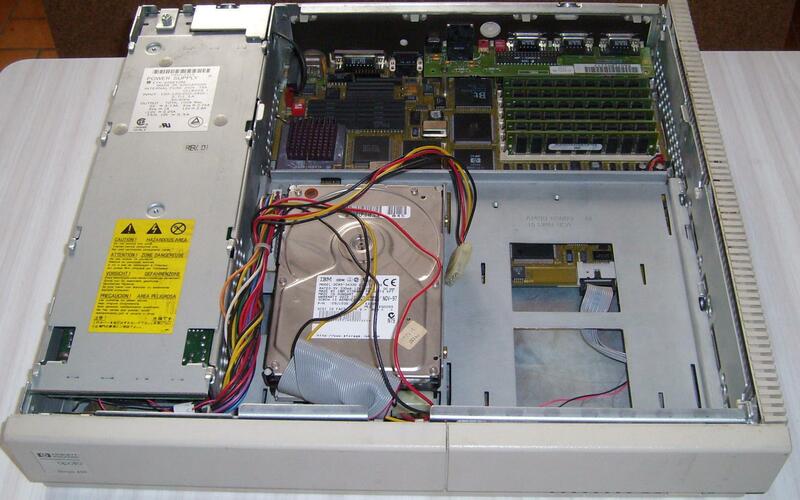 Here is how the machine looks with the disk drive removed; this is not too different from how I got the machine in 2003. You might be able to notice that the motherboard power connector goes through a hole in the storage tray; it is thus necessary to unplug the motherboard to be able to remove the tray from the chassis. And here is the unobscured motherboard. Nothing special to see, but now is a good time to rant about the internal SCSI cable: the internal connector is actually wired in an inverted position, which means that the canonical cable guides (two notches on the sides, and a small bulge in the center) need to be matched on the other side, in order to get proper SCSI operation. Here is a better view of the motherboard, with all the connectors removed. As mentioned earlier, there are no expansion connectors on this machine; everything comes built-in: 6 memory slots, to be set in pairs, allowing up to 48MB of memory (SIMMs larger than 8MB do not work), SCSI, on-board high resolution frame buffer, 3 serial ports, one parallel port, 8-bit audio, Ethernet, and HIL and Domain keyboard connectors. 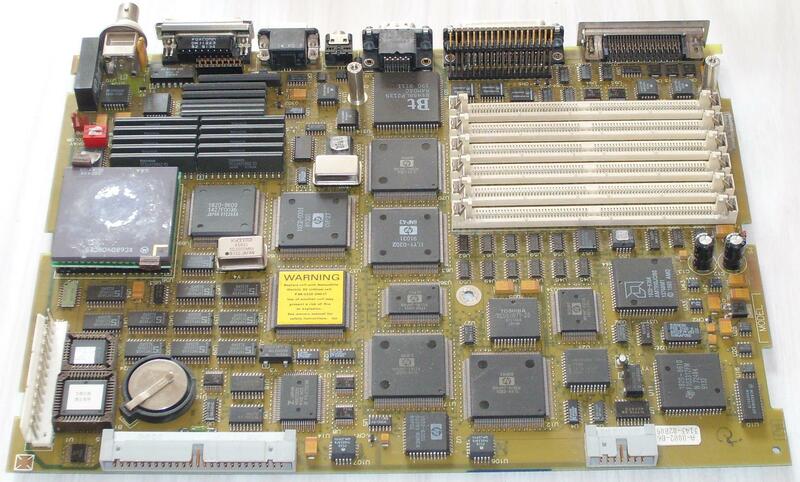 Here is a better view of the motherboard, without memory and the extra connectors riser. I even removed the processor heatsink in this picture. Here is a better look at the riser. The HP Museum owns a similar machine. Link to the museum page for this machine. From there, the DomainOS flavour owner's guide can be downloaded. OpenBSD runs nicely on the 425e. All on-board devices, but the parallel port, are supported. There is currently no X server for the on-board frame buffer, though.